Photo Booth Boutique is a really fun way to capture your special day! Q. Are you thinking about having a wedding or party photographer, unsure of what entertainment to offer or wondering what party favours you can give your guests? A. Well our photo booths take care of all this for you. Our custom built digital photo booths have an easy to use touch screen operation and your dedicated attendants will help you get the most from your booth. Its curved design is visually stunning and looks great at any party, plus you have a free choice of plain, patterned or vintage backdrop curtains. Our booths offer Colour and Black & White Photos as well as Video Messages. We also offer Instant Facebook Sharing, where you can send a photo directly to your facebook profile page. Each time a guest uses the booth they get an INSTANT printed copy of their photo. Remember that you have unlimited use, so you are assured to get plenty of great pictures at your special event. PHOTO MESSAGE (FREE) - You can add a short personal message to every photo. PHOTO ARTWORK (FREE) - We can add a colour or pattern to the backgound of your photo. We can also add company logos for corporate events. For corporate branded events or extra special parties we can custom print the outer skins so it looks like your very own photo booth. 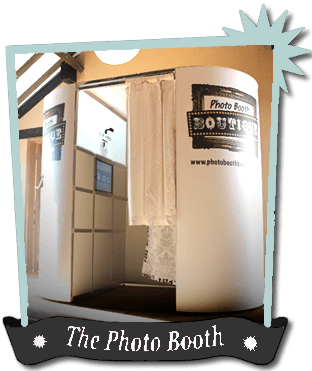 Contact us for details and prices at: info@photoboothboutique.co.uk or fill in our quick and easy enquiry form. If the booth is too big then try our Photo Pod. This is a freestanding photo wall without the attached booth so no backdrop is required. The facilities are exactly the same but the unit is more compact. It’s equally impressive and a perfect solution if space is limited. Simply use the touch screen in front of you to choose from Photo or Video mode and you are ready to go! Your attendants will help you with this. Watch the short video below to see a booth being built at a recent wedding. Photo Mode: choose from either a series of 4 smaller photos or 1 single larger photo. The photo booth counts down before taking a picture so you can be ready for your pose, although we find that some of the best pictures can be the ones you aren’t ready for. Then choose either colour or black & white and a single copy of the picture is printed instantly for your guests to view and keep. Your guests can return to the booth as many times as they like. Choose the DOUBLE PRINTS option, for twice the fun. The extra set of prints can be given straight to your guests or we can put them to one side for you to keep. Choose the PHOTO ALBUM option and we will use the best photos from the second set of prints to compile a beautiful keepsake of your special day. 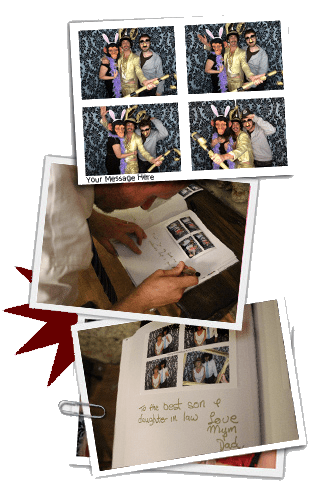 Your booth attendant will affix the photos into a beautiful album and your guests can write a short message next to their own funny pictures. We think this is a fantastic way to remember your day for years to come. 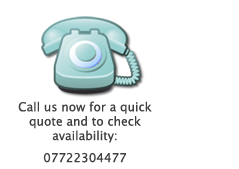 Video Messages (FREE): pressing the video mode means your guests can record a short video message for you to watch again and again. All your photos and video messages are uploaded to a USB (flash drive), which is given to you at the end of your event, or sent to you in the post.